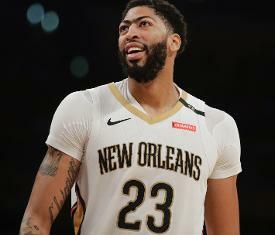 New Orleans Pelicans star Anthony Davis, whose request to be dealt wasn't granted at the NBA's trade deadline on Thursday, soon will get into the lineup. The Pelicans had kept Davis on the bench in recent days to avoid a possible injury in case they decided to trade the 25-year-old All-Star. New Orleans general manager Dell Demps said in a statement, "Anthony Davis will play the remainder of the 2018-19 season for the New Orleans Pelicans. A number of factors contributed to this decision. Ultimately, Anthony made it clear to us that he wants to play and he gives our team the best opportunity to win games. "Moreover, the Pelicans want to preserve the integrity of the game and align our organization with NBA policies. We believe Anthony playing upholds the values that are in the best interest of the NBA and its fans. We look forward to seeing Anthony in a Pelicans uniform again soon." Davis is under contract through the 2019-20 season. According to the Los Angeles Times, the Los Angeles Lakers were willing to trade Lonzo Ball, Kyle Kuzma, Brandon Ingram, Josh Hart, Kentavious Caldwell-Pope and Ivica Zubac to the Pelicans in exchange for Davis. In addition, the Lakers had agreed to part with two first-round draft picks and to take Solomon Hill and his $12.7 million contract along with Davis, the Times reported. Davis, who is averaging career highs in points (29.3), rebounds (13.3) and assists (4.4) this season, had announced his trade request via agent Rich Paul earlier this month. The declaration led to a $50,000 fine from the NBA for violating a rule prohibiting players or their representatives from making public trade demands. Davis has not played since Jan. 18, missing the Pelicans' past nine games after injuring his left index finger. He has been a healthy scratch this week, with New Orleans coach Alvin Gentry saying Wednesday that the team wouldn't play him until after the Thursday trade deadline. The Pelicans are 3-6 without Davis in the lineup, including a 125-120 road win against the Chicago Bulls on Wednesday. The Pelicans' next game is at home Friday against the Minnesota Timberwolves.